Why Do Dramas Do That? : Part One is the first in an informative ebook series about Korean TV dramas, or Kdramas. This is a must-read for any Kdrama fan, especially one not from South Korean culture. The ebook has a lot going for it: It is short, to the point, and separated into easily-navigated chapters detailing key South Korean culture points, lingo, characters, story arcs and the like. This information makes watching Korean TV all the more exciting. For instance, I had no idea just how crazy the shooting schedules of Korean TV can be, so I enjoyed the tidbits and stories regarding that the most. 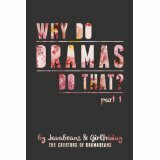 The ebook is written by JavaBeans and GirlFriday, the creators of a great website called dramabeans.com. If you want awesome Kdrama reviews, check out their site. You won’t be disappointed, as the reviews are in depth and insightful, and it’s obvious that the writers truly appreciate the subject matter. They also have a wealth of viewing history and thus information, so they are truly informed critics. I, for one, cannot wait for the next part in the series.